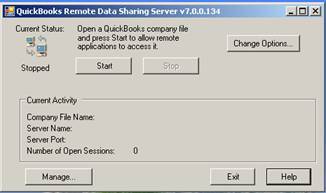 Note: As an alternative to Remote Data Sharing (RDS) we suggest you to use QRemote. Note: QODBC has the ability to talk to a copy of QuickBooks running anywhere in the world over the Internet, or over a local area network using the Intuit Remote Data Sharing Server. This feature is built-in and requires no additional charge. If you are using an older version of QODBC v6, 7 or 8, see the previously used How to Setup QODBC Remote using Remote Connector. 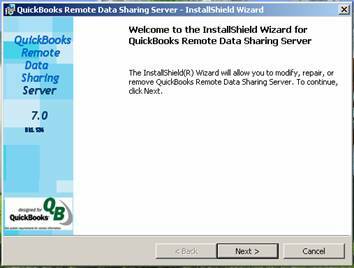 QuickBooks Remote Data Sharing (RDS) is software that allows an integrated application to communicate transparently with QuickBooks 2009 company files on another machine in a network (typically a LAN). 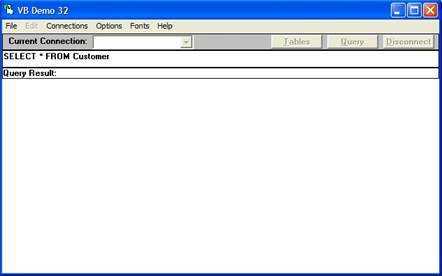 The communication is transparent because the application itself is not aware that it is accessing QuickBooks remotely. The RDS consists of two components: the RDS server and the RDS client. 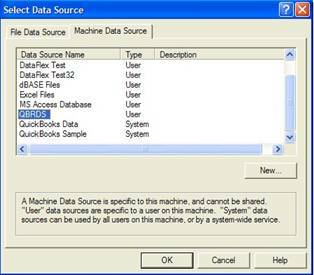 The RDS server must be installed on a machine on which QuickBooks is installed. 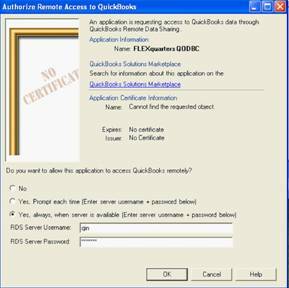 (QuickBooks need not be running, depending on the access mode selected at the RDS server.) The RDS client must be installed on the machine that is running your application and QODBC. 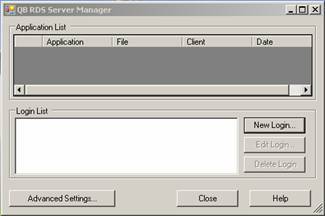 Note: The RDS Server and Client application now also work for 64-bit system users. Just download them from the link below. 2. Install RDS server software and set it up on the machine that runs QuickBooks. 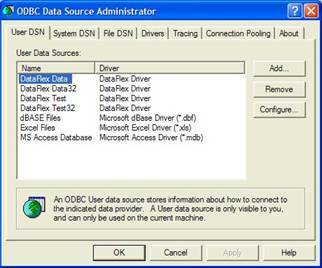 (1) Double click the RDS Server Installation icon and install. 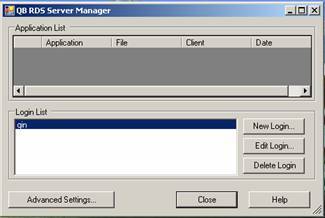 (2) Click Next, Click Install and Click Finish to complete RDS server's installation. 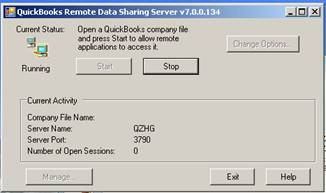 (3) From your Start>All Programs>QuickBooks icon double click on the Remote Data Sharing Server to launch the Control Panel. 1. Start the RDS server by clicking the Start button. When the server-side information is configured and the service is started, clients come through RDS server remotely to access the QuickBooks data. 2. RDS services can be terminated by clicking on the Stop button. 3. 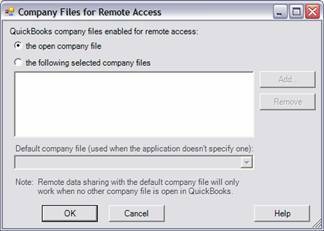 The default company files for remote access is set to the currently open file, to select specific company files to be used remotely use the Change Options button. 4. At least one RDS login and password must be created at the RDS server for use by remote applications, this is done through the Manage button. 2. Add a user login name and a password at least 6 characters long and confirm, click ok. The username has been added to the Login List, which can be edited or deleted at any time. Next, click on the Advanced Settings button. 4. 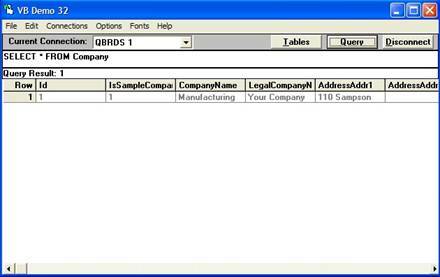 Click on Change Options to specify the mode the company file will be accessed. If you specify the open company file, then QuickBooks must be running on the same machine as the RDS server and a company file must be open. All remote applications must then use whatever company file happens to be open. If you specify the following selected company files, QuickBooks does not need to be running and remote applications can access any of the company files that you add to the company files list. Click OK to close the dialog box. If RDS server is being run for the first time with the QuickBooks company file, permissions must be granted by QuickBooks for this access. Click the RDS Start button, a QuickBooks dialog box like the one shown above will display. Select the Yes, always; allow access even if QuickBooks is not running the option, Click continue and then done. RDS Server is now waiting for the RDS Client to access it. 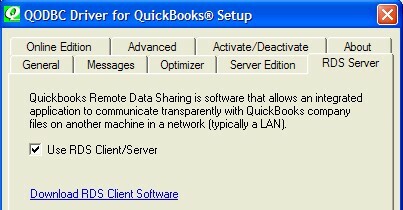 Note: Now that the RDS server with QuickBooks on it set up, the Client side needs to be configured to talk to it. On the Client side, you have an ODBC compliant application that needs to access the QuickBooks company file which will need a “bridge” to talk to the data, besides just having a connection between the two computers. 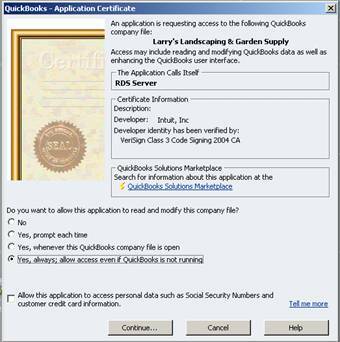 QODBC provides a standard ODBC interface that allows virtually thousands of ODBC applications to access QuickBooks data and communicate with it. 2. 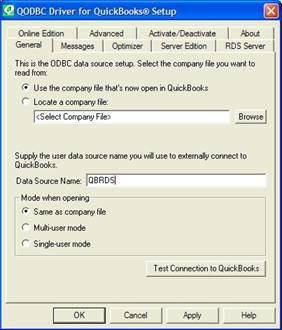 Install RDS client software and set it up on the machine that runs the application that will access the RDS Server with QuickBooks. Download QODBC and run the QODBC.exe. Follow the prompts during the installation, if you have purchased QODBC enter the CDKey you were issued on the Activation screen when prompted for. If you are evaluating the product just Click next and finish following the screen prompts and then Click finish to complete the installation. 3. 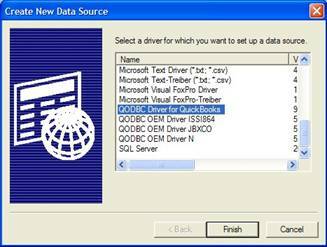 Select QODBC Driver for QuickBooks and Click Finish and the following QODBC setup screen will launch. 5. Switch to the RDS Server Tab. Check Use RDS Client/Server box, then Click on Apply and OK. The new DSN is now configured for remote use. 1. Go to Start>All Programs>QODBC Driver for use with QuickBooks icon, select the VB Demo icon and double Click which will launch the VB program. 2. Click on Connections>Add New Connection. 3. From the Select Data Source Machine Data Source Tab, highlight the remote DSN and Click OK. 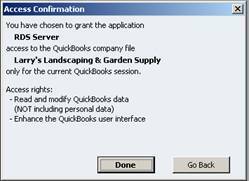 If the RDS Server is running and the VB Demo tries to access the QuickBooks data the following Integrated Applications screen from QuickBooks will pop-up. Check “Yes, always, when the server is available” and then input the RDS Server Username and Password. 4. Your Current Connection should now show the remote DSN that was selected. The default SQL statement in the VB demo is SELECT * FROM Customer, delete this statement and type in SELECT * FROM Company and Click Query which should return a record. Click Disconnect and close the VB Demo application. You are now ready to connect your application remotely using the QODBC DSN that has been configured for remote QuickBooks access! The RDS Client needs Microsoft's.NET Framework to run, if you receive any errors regarding the.NET framework you will need to install the latest server pack from Microsoft to correct the problem. The Reasons: Perhaps could be caused by the “DNS Server” of the RDS Client is inconsistent with the “DNS Server” of the RDS Server. The solutions: Modify the DNS Server listed under your settings for your network connection to match. Ask your network administrator if you need help with this.